The FIA Stewards at Imola decided to give Ralf Schumacher a 25-second penalty for an unsafe pit stop, arguing that the Toyota driver was released into the path of Nick Heidfeld's Williams. Heidfeld said that he had to brake hard to avoid the Toyota. The penalty means that Ralf drops from eighth to 11th and moves Heidfeld into the points. 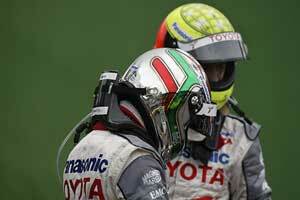 It also means that Mark Webber and Tonio Liuzzi move up from 10th and 11th to ninth and 10th. The Toyota team has appealed the decision, arguing that the rules are vague and that similar incidents have often gone unpunished in the past. The appeal will have to be heard by the FIA International Court of Appeal at some point but for the moment there are no further details of when the hearing might take place. The Toyota argument is an interesting one and no doubt the team will now try to dig up plenty of video evidence of similar incidents which went unpunished.